Mecca News– The black kabba stone reveals a demon thus spirit being grasping a box from a alter, box appears to have a triangle & eye of god insignia on-it. Kiss and telling; the kaaba black stone I would not be sticking my lips on it with me knowing what it contains? I to do believe this black stone was once white before and this is also is according to the told history of the mysterious kaaba black stone, and now with me pointing out this spirit being that lies in it also strengthens this Islamic hypothesis old story, he [ the spirit being] is described as this illusive being been of white in color? 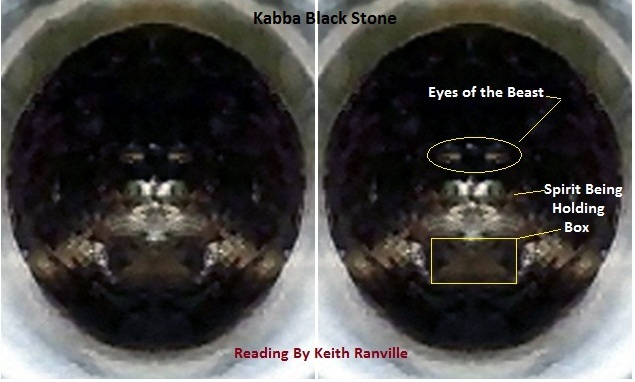 However there is also a demon beast inside of this kaaba black stone as well according to my shamanic native reading of it?